Commissioning of the laboratory had been undertaken jointly with the University technical services, with the collaboration of the Institute of Agriculture Research, and with additional equipment commissioned from the Meteorological Service of the Cyprus Government. Air quality tests had been conducted with the aid of the Environmental Air Quality Section of the Ministry of Labor. LBI had already been inspected and had secured official licenses from the Veterinary Services of the Department of Agriculture, according the Cyprus legislation and the European directives. LBI had set its own independent risk assessment and action plans and had established a streamlined plan for ordering, handing and managing animals. A joint collaborative agreement was in place with the Histology lab of the Veterinary Services of the Department of Agriculture for tissue analyses. 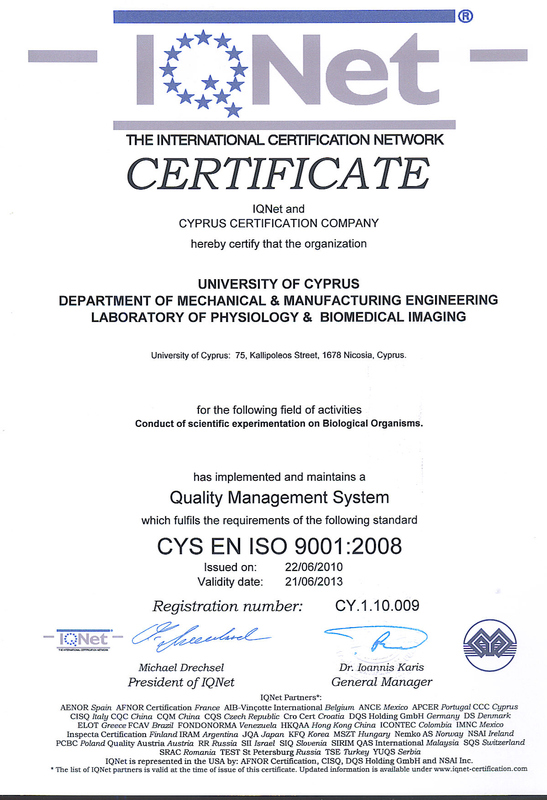 In the summer of 2009, LBI initiated procedures for securing ISO 9001 certification to ensure provision of quality assurance and control in the processes and deliverables of the laboratory, having secured a loan-grant from the UCY Senate, post-completion of a third-party consultant ISO 9001 evaluation report and an action plan for compliance. 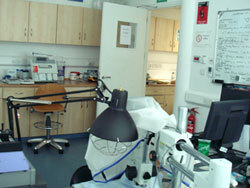 The lab was certified with the ISO 9001 certification in June 2010. 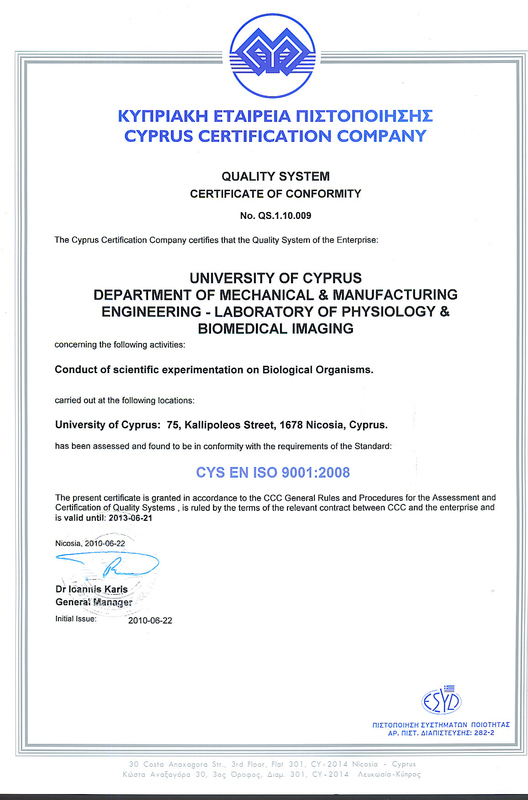 Instrumental for both the lab commissioning and the lab ISO certification was the dedication and commitment of collaborator Mr. Anastasios Nicolaou. Lab equipment included devices for real time recording of animal vital signs, a dual syringe pump for fluid and drug infusions, a full-range of microsurgical tools for techniques under microscopic guidance, a digital camera and plasma TV system for real time visualization of microsurgeries for teaching and training, flowmeters and vaporizers for controlled administration of anesthesia/gas mixtures, a ventilation setup, a hot plate, two weight balances, a centrifuge system, micropipettes, tissue fixation chemicals, a negative-pressure N2O suction pump, an inhalational anesthesia scavenging system, a blood gas analyzer, an eight-channel real-time recording system for real-time pressure-volume recordings with miniature conductance catheters, a dedicated ultrasonic mouse flow probe for invasive blood flow measurements, pressure and volume calibration phantoms, and a dynamic multimodality heart phantom. The lab has also been equipped with five dedicated workstations that support computational fluid dynamics (CFD) and electromagnetic finite element analyses (ADINA, XFDTD), the visualization, image analysis and processing packages Analyze and Matlab, software for real time physiological signal recordings (BIOPAC, Indus), and real-time pressure-volume catheter recordings (PVAN). The laboratory had immediate access to Departmental resource equipment that included (among others) a Dynamic Mechanical Analysis (DMA), a Scanning Electron Microscopy (SEM), and an Atomic Force Microscopy (AFM) system for surface morphology, and tissue characterization and testing.